The town of Centralia is the closet thing to a real life hell town. It started off in 1842 when the land was bought by the Locust Mountain coal and iron company, and one of the mining engineers moved his family into the area and began planning a village to support the extraction of coal. The town was originally named Centreville but was changed in 1865 since the U.S post office already had a Centreville elsewhere. The town quickly grew since the area was very rich with coal and needed a supporting workforce to extract the huge amounts of resources buried in the earth, and at its peak the town had a population of 2761 in the year 1890 and life looked profitable in the town. 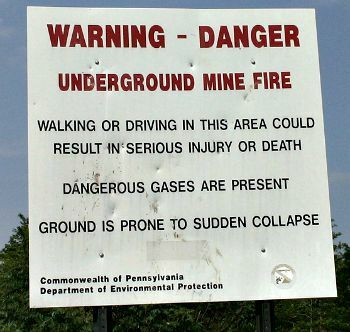 However all this was about to change in the year 1961, as a fire broke out beneath the earth and it ignited the remaining coal layers under the town. Today the land has been scorched and broken by the immense heat rising up through the ground, and now poisonous gases and areas of ground so hot a match can be ignited just by being placed against it now litter the area. 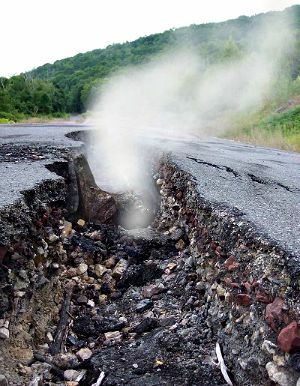 Below is an example of one of Centralia's roads, this kind of break in the earth is common throughout the area and has destroyed all of the towns roads. What exactly started the fire is not known, but there are two main theories about how it happened and they are both believed to be complete accidents. The first tells of how a group of fire fighters were hired to dispose of an old rubbish dump that lay in an old strip mine pit, which they did by setting it on fire, as was common during those years. Its thought that the after the main bulk of the fire was finished burning the rest was not extinguished properly and the fire spread into one of the many tunnels and ignited a bed of coal, which in turn set fire to the rest of the connecting tunnels. The other theory suggests how a few days before this a trash hauler dumped a load of rubbish which contained smouldering ashes into one of the abandoned mine shafts which was designated as a tip, and the ashes managed to make contact with some remaining coal in the shaft and spread throughout the labyrinth of tunnels. Below is one of the warning signs which can be seen around the town, though it does not prepare people visiting for the horror like scenes and the scarily close resemblance to the horror game Silent Hill. The first thing I'd like to get out of the way about this place is the references to the game Silent Hill. If you are not familiar the game involves a town that has an underground coal fire burning beneath it that is actually the work of the devil who sends up his minions to torment and kill anyone who gets trapped in the town. People have made up all kinds of stories about seeing beings from the game roaming around the town and chasing people, which is absolutely ridiculous since everything from the game can be proven to be 100% fictional. There are however a few interesting stories about strange things which have been seen here which have back stories based in fact. One such story comes from the time when the towns founder, Alexander Rae was murdered on October 17th, 1868 by members of and Irish gang called the Molly Maguires. Three men were eventually convicted of his murder and sentenced to death by hanging. People have claimed to have seen the apparition of Alexander in the area, though I do not see how people would know it was him specifically. The Molly Maguires did not commit this murder as a one-off, and since there was quite a few of them in the town a number of murders and acts of violence and arson were committed within the here. There reign of terror would come to an end in 1877, when at least a dozen of the gangs leaders were hanged for their crimes, which leads to the next claim of paranormal activity here. Apparitions of the Molly Maguires have been seen in the area, all of which are hanging from random trees around the town, which seems odd since they were all hanged together from gallows, but this doesn't seems to stop the claims of them being seen from being reported. There is also a local legend that tells of how the first Catholic priest to live in Centralia cursed the town after being assaulted by three members of the gang in 1869. He said that a day would come where the only remaining building in the whole town would be the St Ignatius Roman Catholic church.